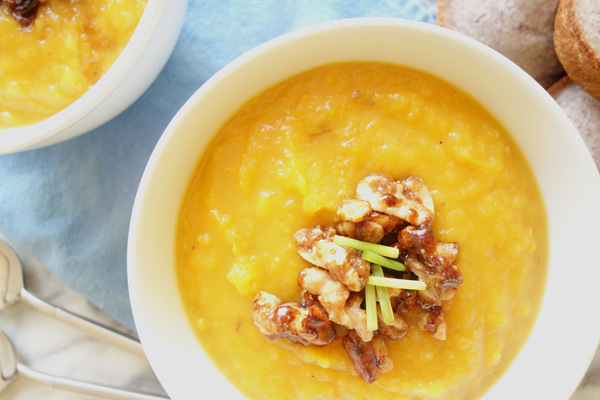 Nothing says fall like butternut squash soup. I’ve been pretending it hasn’t been 85 degrees in Southern California by making soups weekly. Soups are easy comfort food and this one is no different. If you haven’t made homemade soup before, you’ll be surprised at how easy it is. If you haven’t made butternut squash soup, well, let’s rethink those life choices. And if you’re reading this in Minnesota or somewhere else getting snow this week, I think you’re going to want to stock up on butternut squash soup…winter is coming. Sometimes you’re going to have a busy week and need something filling that can go a long way. Butternut squash lasagna is your meal. This butternut squash lasagna was not only filling, but reheats well, making it great leftovers for lunch or dinner later in the week. Don’t be intimidated by the number of steps, it is really easy to make (and easier to eat…). I’m glad I took a break from sweet potatoes to make this lasagna and I love that I can be lazy efficient with my time by getting many meals out of this one dish. If you own one of the best vacuum sealer, saving the leftovers has never been easier. Happy Meatless Monday!